Welcome to our Undergrad Ministry at Texas A&M and Blinn-Bryan! Students at Texas A&M and Blinn-Bryan have a vibrant and welcoming ministry that all students, regardless of background, are invited to join! At the center of our life together is the "The Table." Each week is something different, but always includes service, sacraments, prayer - and a home-cooked meal! This happens every Tuesday at 6:15 during the semester. Students of any, all, and no faith tradition are welcome at our dinner table as we explore together what it means to love and serve God and our neighbors -- all our neighbors. Students also engage in small group Bible studies, which meet during the week. Mike leads a young adult Theology on Tap group, and Pastor Mindy also leads a Sunday night small group. 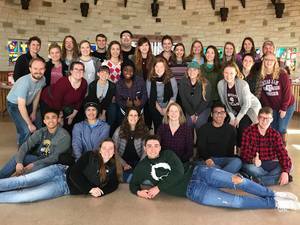 Service & Justice projects, retreats, ecumenical/interfaith/outerfaith activities and conversation, and social activities are also an important part of this fellowship. Keep an eye on the calendar to see what we've got in store!